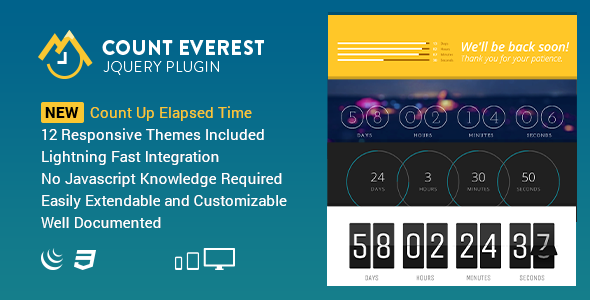 Count Everest Countdown | Responsive jQuery Plugin Created by Anacoda. This templates have specific characteristics, namely: Get your own easily customizable countdown script without any further JS knowledge! Count Everest is quickly integrated into your own markup. It’s extendable with callback functions, provides many options (e.g. : left-hand zeros), and comes with an easy-to-follow documentation. Localize it within . Get your own easily customizable countdown script without any further JS knowledge! Count Everest is quickly integrated into your own markup. It’s extendable with callback functions, provides many options (e.g. : left-hand zeros), and comes with an easy-to-follow documentation. Localize it within seconds. Use your own font. And enjoy it even in Internet Explorer. We can’t wait to see what you create with it. This layout is using the HTML5 canvas element, which is NOT compatible with older Internet Explorers like 6, 7 and 8. Set up the plugin within minutes. Choose your favourite layout, set your target date for the countdown and upload all necessary files. It’s really that easy. We included 12 responsive layouts that you can use on your website. We have a powerful and detailed documentation online and also packaged in the plugin zip folder. You just want to display the remaining hours of your target date? No problem! You can easily handle this within your HTML markup. You can show days, hours, minutes, seconds, deciseconds and milliseconds. You can define your own wording for every time unit label. Use this option to force left-hand zeros. Every value will have two digits unless there are more digits necessary to display the remaining time (e.g. days and milliseconds). You can define your own current date and time (e.g. the server time via PHP). Otherwise the plugin uses the current time of the browser or operating system. Define the offset from coordinated universal time (UTC) for the location of your target date to sync the countdown in the browsers of the users around the world. You can even use Count Everest to count up elapsed time, e.g. to show website visitors the time spent on your website. Please refer to our documentation to see examples. pause, resume, destroy, getOption and setOption. We can’t wait to see what you create with our countdown plugin.